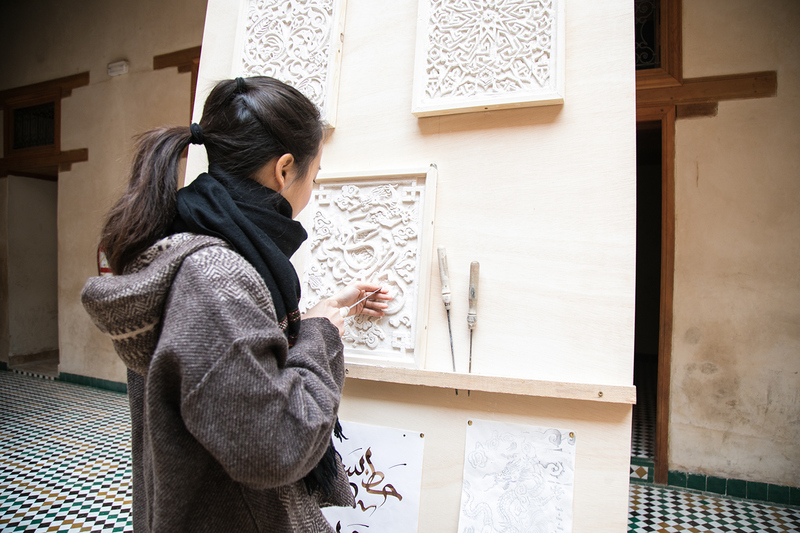 Pattern design on Moroccan plasterwork with traditional Chinese elements. Master Abderrazak Bahij, Si Mohammed, and Prof Khalid Lazrak. 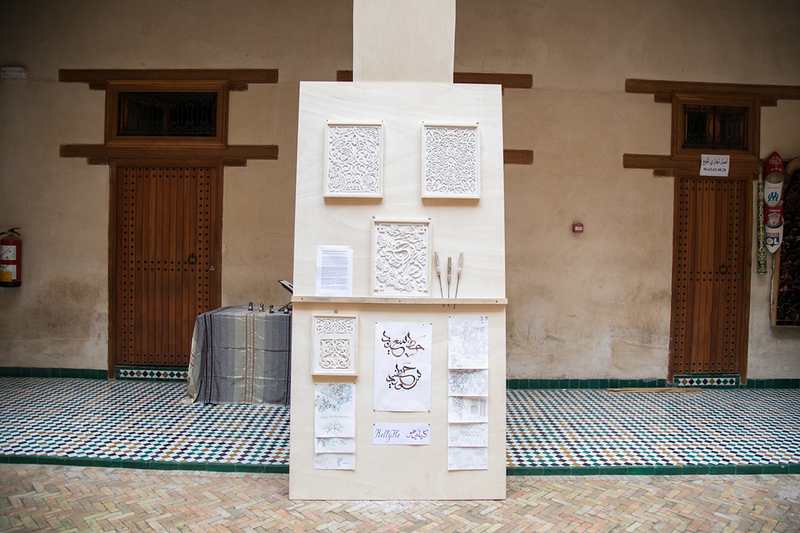 The final public presentation was a collaborative in-progress carving performance on site, which took place in Kettanine Fondouk, a historical building located in the world UNESCO Heritage site Fes El Bali. 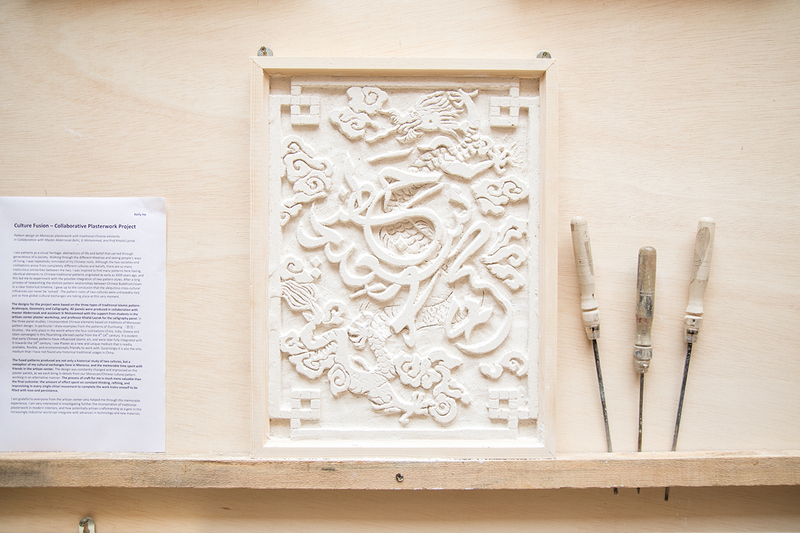 Details of performative carving panel- A fusion of calligraphy character 'Good Luck' in Arabic and Chinese styles. I see patterns as a visual heritage- abstractions of life and belief that carried through generations of a society. Walking through the different Medinas and seeing people’s ways of living, I was repeatedly reminded of my Chinese roots. Although the two societies and civilizations arose from completely different cultures and beliefs, there are so many meticulous similarities between the two. 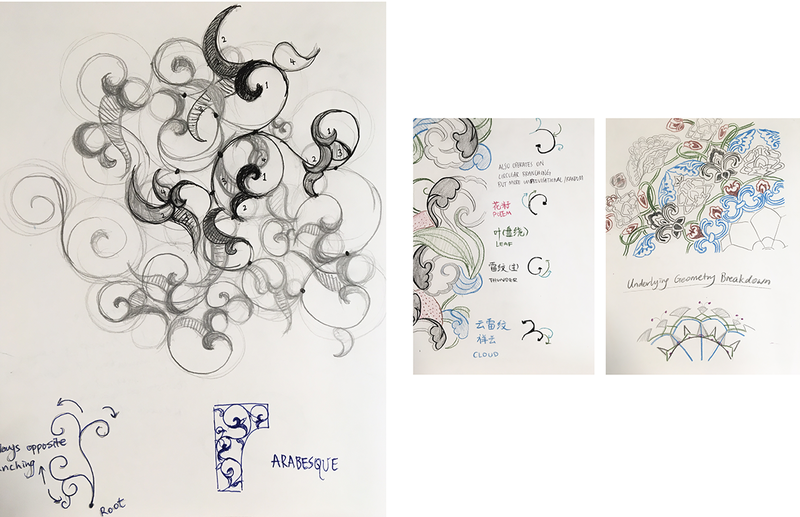 I was inspired to find many patterns here having identical elements to Chinese traditional patterns originated as early as 3000 years ago, and this led me to experiment with the possible integration of two pattern styles. 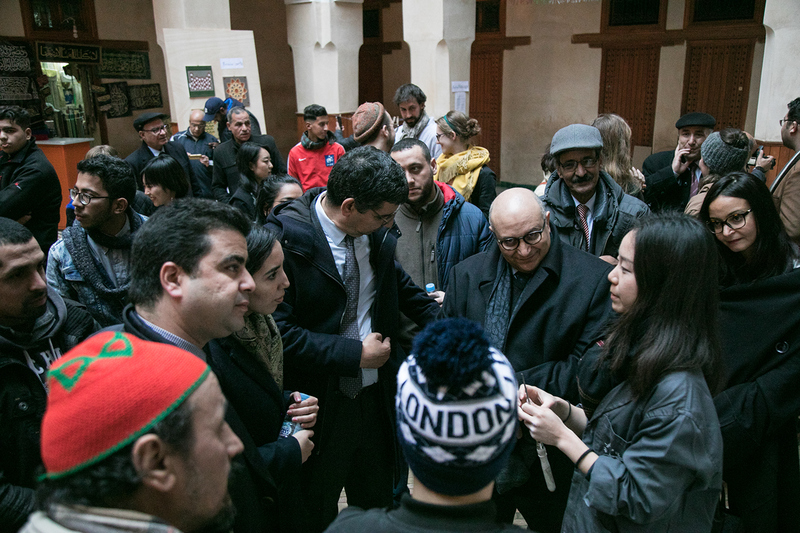 After a long process of researching the distinct pattern relationships between Chinese Buddhism/Islam in a clear historical timeline, I gave up to the conclusion that the ubiquitous cross-cultural influences can never be ‘solved’. The pattern roots of two cultures were untraceably tied, just as how global cultural exchanges are taking place at this very moment. 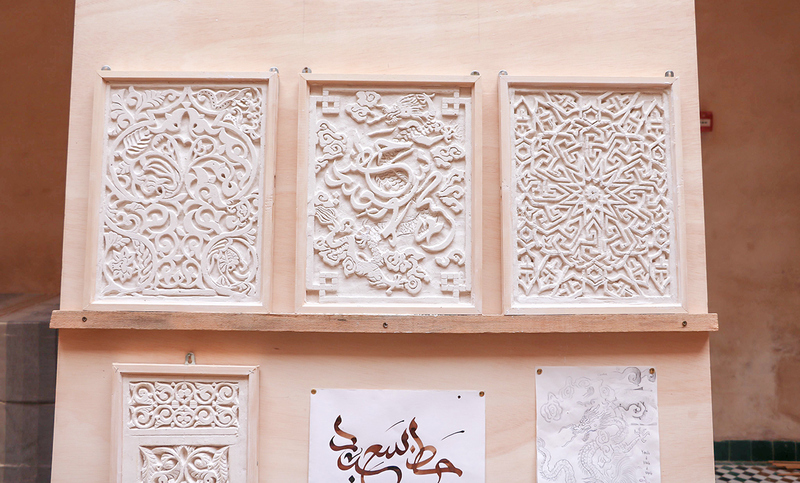 The designs for the project were based on the three types of traditional Islamic pattern: Arabesque, Geometry and Calligraphy. 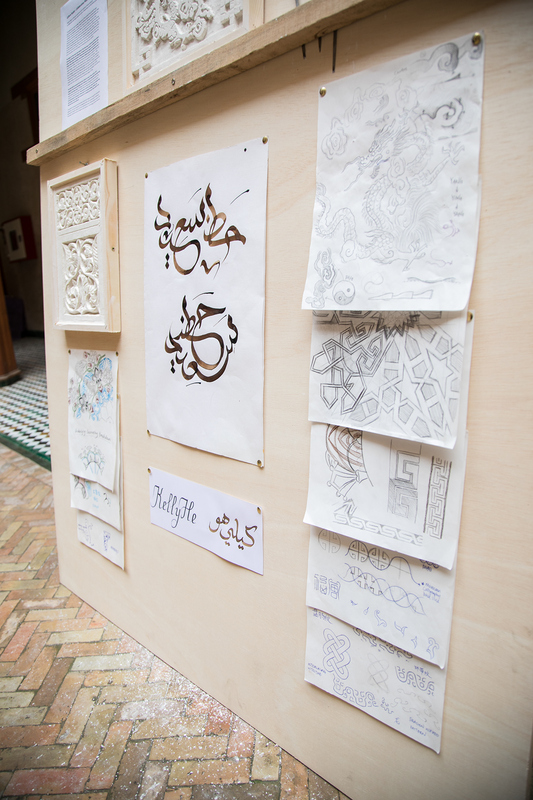 All panels were produced in collaboration with master Abderrazak and assistant Si Mohammed with the support from students in the artisan center plaster workshop, and professor Khalid Lazrak for the calligraphy panel. 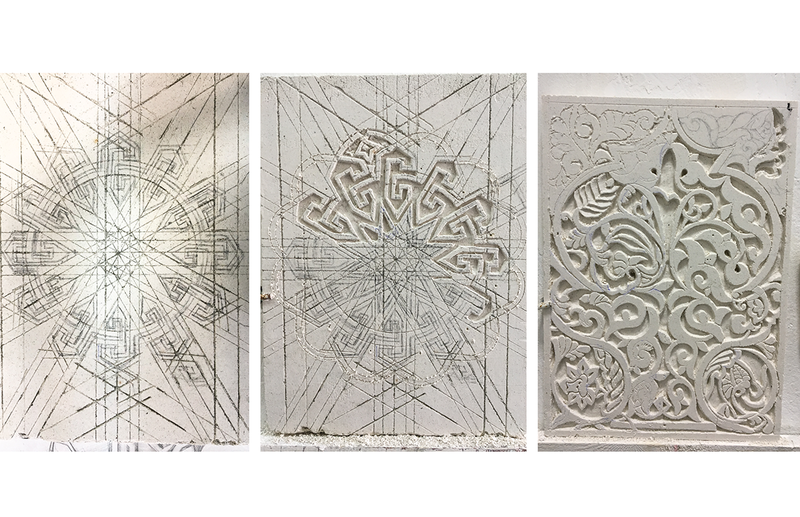 In the three panel studies, I incorporated Chinese elements based on traditions of Moroccan pattern design. 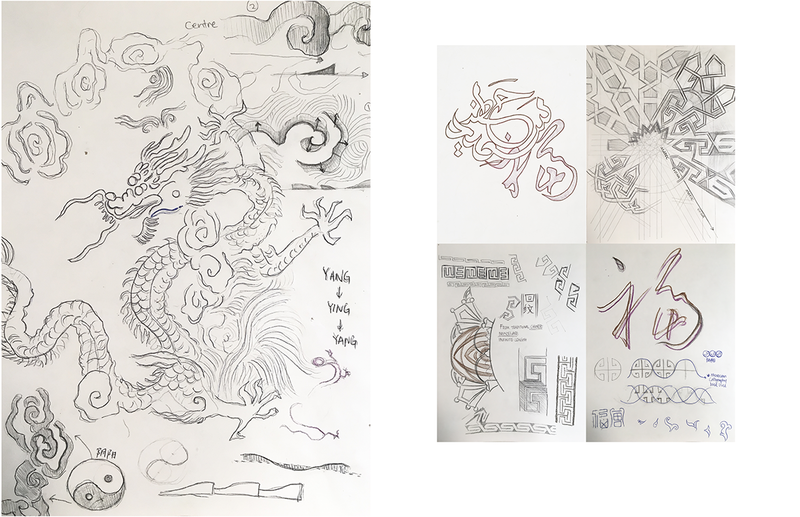 In particular I drew examples from the patterns of DunHuang (敦煌) Grottos - the only place in the world where the four civilizations-China, India, Greece and Islam converged in this flourishing silkroad capital from the 4th-14th century. It is evident that early Chinese patterns have influenced Islamic art, and were later fully integrated with it towards the 14th century. 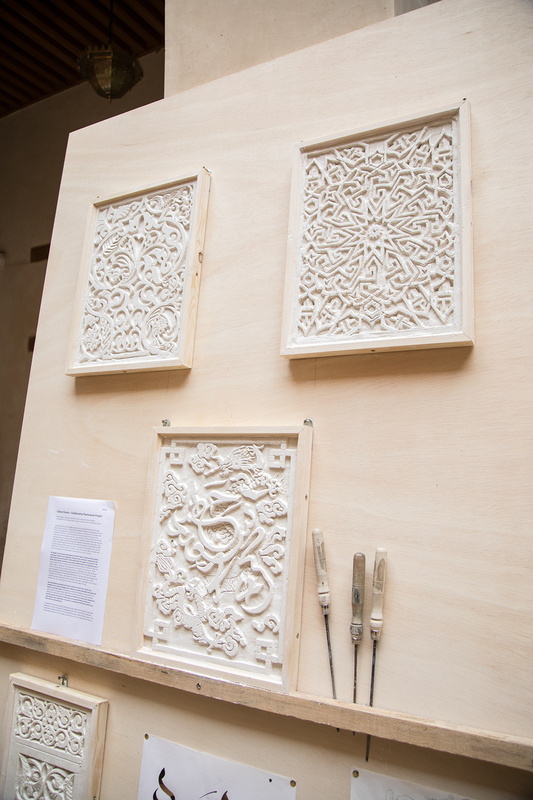 I see Plaster as a new and unique medium that is readily available, flexible, and environmentally friendly to work with. Surprisingly it is also the only medium that I have not found any historical traditional usages in China. Master Abderrazak improvising on my existing designs. 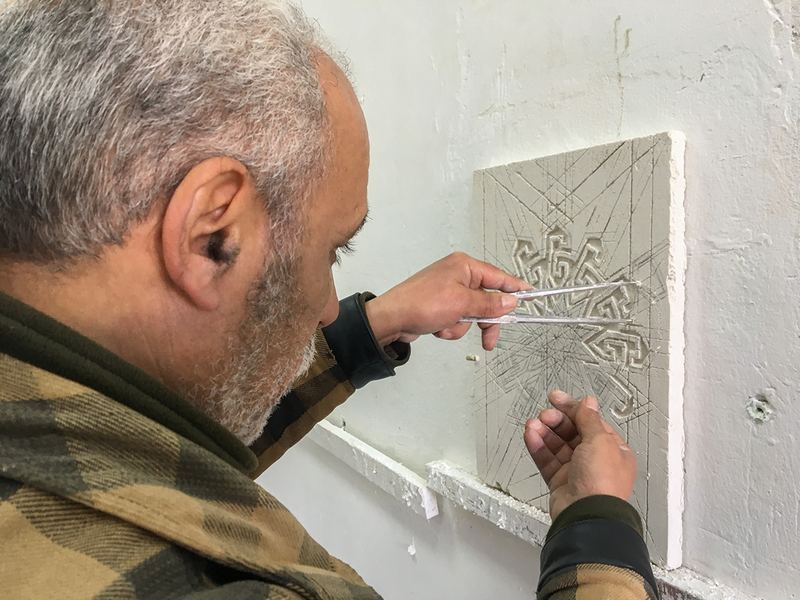 The fused patterns produced are not only a historical study of two cultures, but a metaphor of my cultural exchanges here in Morocco, and the memorable time spent with friends in the artisan center. 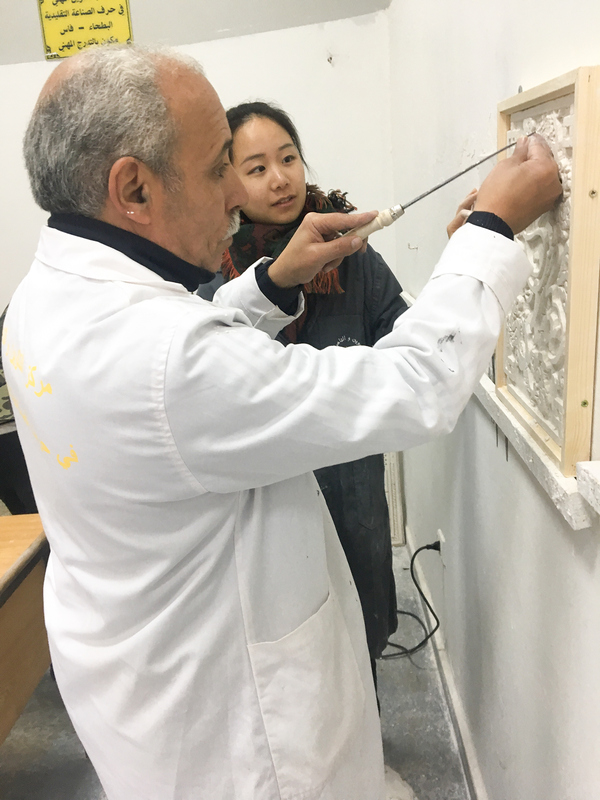 The design was constantly changed and improvised on the plaster panels, as we each bring in details from our Moroccan/Chinese cultural pattern working in an alternative manner. The process of craft for me is much more valuable than the final outcome: the amount of effort spent on constant thinking, refining, and improvising in every single chisel movement to complete the work trains oneself to be filled with love and persistence. 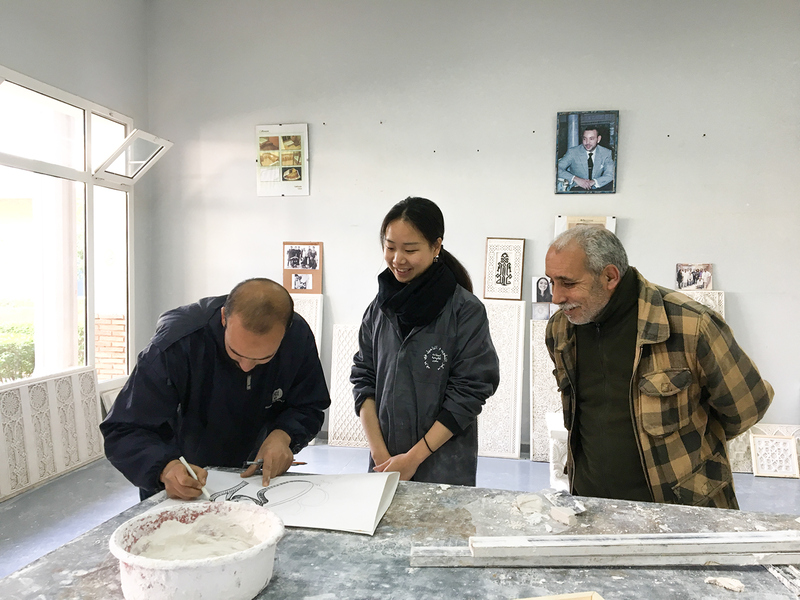 I am grateful to everyone from the artisan center who helped me through this memorable experience. 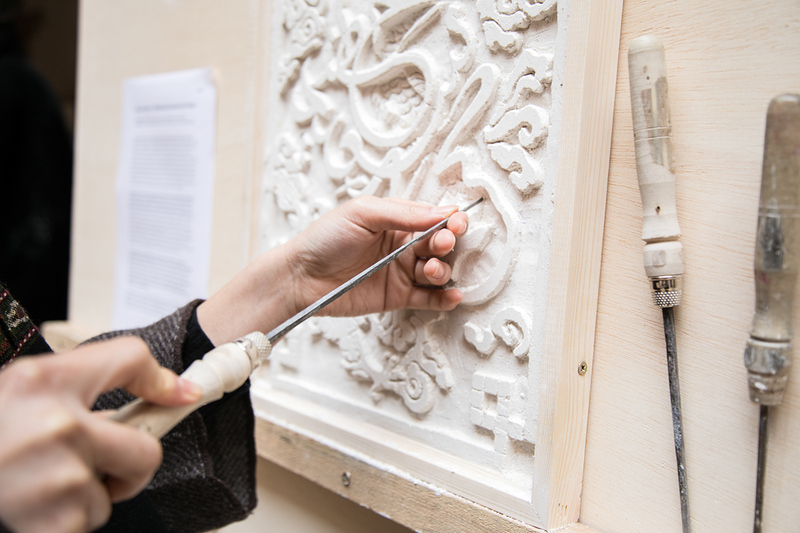 I am very interested in investigating further the incorporation of traditional plasterwork in modern interiors, and how potentially artisan craftsmanship as a gem in this increasingly industrial world can integrate with advances in technology and new materials. 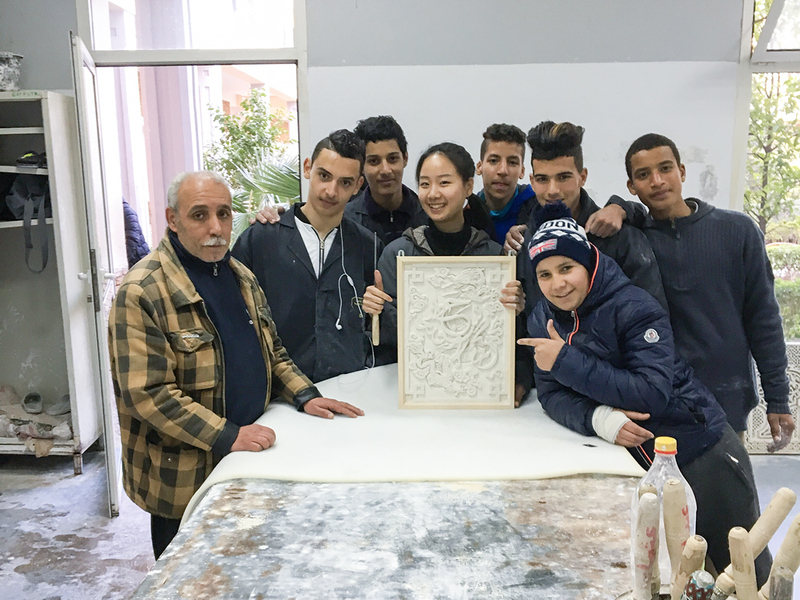 A collaborative series of pattern design on plasterwork studies with local master artisans and students in Fes, Morocco. 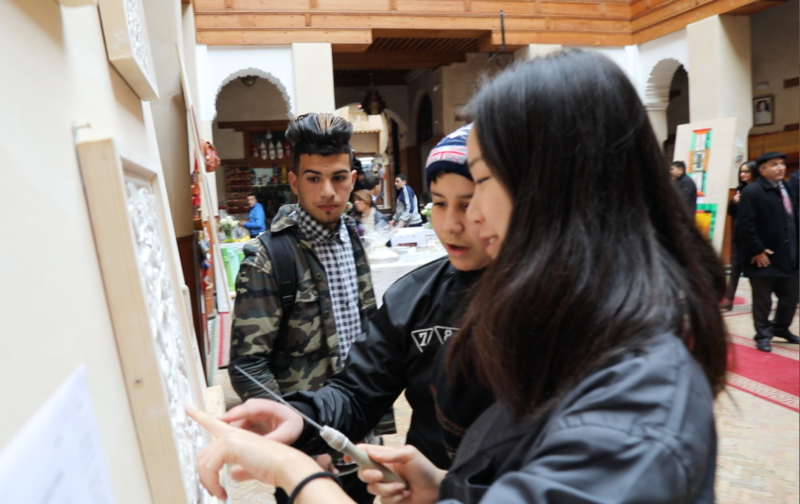 This project is the final cumulation of a one month cultural exchange travel course for RISD wintersession 2018, partnered with the Morocco ministry of handicrafts.